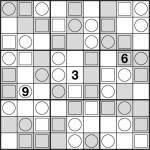 Sudoku Trio Odd/Even 9×9 1 puzzleI often post pretty challenging puzzles here, so I thought I’d entirely reverse that trend by publishing probably the easiest 9×9 puzzle with minimal givens you’ve ever seen. Simply place 1-9 once each into every row, column and bold-lined region, as in a regular sudoku, but in this Odd/Even puzzle all of the even digits are in shaded cells. This is also a Trio sudoku too so each of the cells with an inset square contains 4, 5 or 6 and each of the cells with an inset circle contains 7, 8 or 9. Those without an inset square or circle contain 1, 2 or 3. Using these rules you need only 3 givens for a valid unique puzzle. That’s the minimum number as you can probably easily convince yourself, because, despite its perhaps intimidating appearance, it’s essentially a set of trivial 1- and 2-digit sudokus laid on top of each other.